Coffee beans were placed into the top hopper and with the turn of the handle (and wheels), the grinding mechanism within the mill would crush the beans into granules. These grounds were then kept in the small lower base drawer until needed. 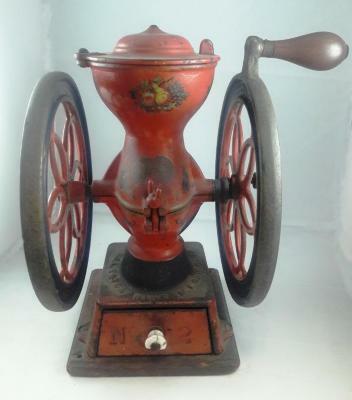 The Enterprise Company had manufactured at least a dozen different versions of the tabletop "wheel" coffee mills over the fifty-year period from 1870 to 1920. According to an article entitled "Coffee Mill Manufactures," from The Macmillan Index of Antique Coffee Mills and the Enterprise No. 2 Coffee Mill as shown at Meeker's Patented Antiques, this same coffee mill, in later years, was labeled as patented in 1898, although the one above is labeled with an 1873 date. Therefore, it was probably utilized in the late 19th century rather than the early 20th century.